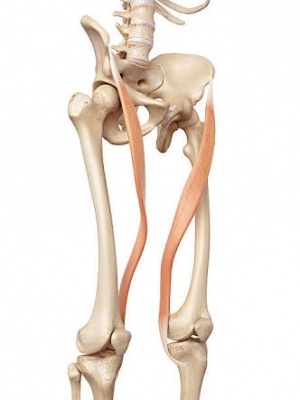 The sartorius muscle is a thin, long, superficial muscle in the anterior compartment of the thigh. It runs down the length of the thigh, runs over 2 joints—hip and knee joints and is the longest muscle in the human body. An exceptional length of this muscle often exceeds 50cm. In such long muscles not all muscle fibres run through the whole length of the muscle belly. It is estimated that at the most 30–50% of fibres run from tendon to tendon. The rest of them end intrafascicularly. The length of a single fibre is estimated at 35–45cm. Just like an S-shaped tape, the muscle belly twists around the anterior, and medial surface of the thigh. It passes behind the medial condyle of the femur to end in a tendon. The tendon, after taking an anterior curve joins with the tendon of the Gracilis and Semitendinosus in the pes anserinus before its final insertion. Sartorius derives from the Latin word sartor, meaning tailor,  and it is occasionally referred to as the tailor's muscle. This name was chosen in reference to the cross-legged position in which tailors once sat. There are slight adaptive ethnic differences in width and the range of muscle belly and tendon of the sartorius muscle. The muscle may be absent in some people. The muscle receives 5 to 11 vessels originating from: superficial circumflex iliac, lateral femoral, deep femoral, descending geniculate, and femoral arteries. At the hip it flexes, weakly abducts, and rotates the thigh laterally. At the knee, it can flex the leg; when the knee is flexed, it also rotates the leg medially. This muscle plays an important part in stabilisation of the pelvis—especially in women. This is due to the constrictive effect which the muscles on both sides of the body have on the pubic symphysis. The Pes anserinus refers to the conjoined tendons of the gracilis, semitendinosus and the sartorius. It lies superficial to the tibial insertion of the medial collateral ligament of the knee. Pes anserine bursitis is a condition in which the medial portion of the knee is inflamed. If the bursa underlying the tendons of the sartorius, gracilis, and semitendinosus gets irritated from overuse or injury, a person can develop this ailment. This condition usually occurs in athletes from overuse and is a common cause of chronic knee weakness and pain. It is characterised by pain, swelling and/or tenderness. ↑ 1.00 1.01 1.02 1.03 1.04 1.05 1.06 1.07 1.08 1.09 1.10 Moore, Keith L.; Dalley, Arthur F.; Agur, A. M. R. (2013). Clinically Oriented Anatomy. Lippincott Williams & Wilkins. pp. 545–546. ISBN 9781451119459. ↑ 2.0 2.1 2.2 2.3 2.4 2.5 Dziedzic D, Bogacka U, Ciszek B. (2014) Anatomy of sartorius muscle. Folia Morphol (Warsz). 73(3):359-62. doi: 10.5603/FM.2014.0037. ↑ Clavert P, Cognet JM, Baley S, Stussi D, Prevost P, Babin SR, Simon P, Kahn JL (2008). Anatomical basis for distal sartorius muscle flap for reconstructive surgery below the knee. Anatomical study and case report. J Plastic, Reconstr Aesthetic Surg, 61: 50–54. ↑ 4.0 4.1 Klein Horsman M, Koopman H (2007) Morphological muscle and joint parameters for musculoskeletal modelling of the lower extremity. Clin Biomech, 22: 239–247. ↑ 7.0 7.1 Wysocki J, Krasuski P, Czubalski A. Vascularization of the sartorius muscle. Folia Morphol (Warsz). 1996;55(2):115-20. ↑ 8.0 8.1 Meyers W, Greenleaf R (2000) Anatomic basis for evaluation of abdominal and groin pain in athletes. Operative Tech Sports Med, 13: 55–61. ↑ Mochizuki T, Akita K, Muneta T, Sato T (2004). "Pes anserinus: layered supportive structure on the medial side of the knee". Clin Anat. 17 (1): 50–4. doi:10.1002/ca.10142. PMID 14695588. ↑ 10.0 10.1 pmr/104 at eMedicine - "Pes anserinus bursitis"